AIM Academy is a college preparatory school for children with language based learning disabilities. AIM teaches students from first to twelfth grade through creating a rigorous academic setting when they are taught by a highly committed, experienced and creative faculty who have ongoing access to the latest research, best practices, technological resources, and experts in their field. We dedicate ourselves to putting research into practice every day through immersive, hands on learning while teaching literacy in creative and forward thinking ways. Through these innovative methods we hope that upon graduation, our students are prepared for the challenges, complexities and choices available to them at university and beyond. Curiosity, collaboration, compassion, confidence and critical thinking are their tools for success. AIM Academy’s Makerspace is located within the schools well known STEAM Wing. Nestled among the science and robotics classroom spaces, the Makerspace is provided for students to develop their abilities in making, doing, collaborating, inventing and more through learning to create 3D representations of their ideas. Some of the equipment that students are learning to use include laser printers, CNC routers, 3D printers, 40 watt laser engravers, an 8 x 16 metal lathe, a scroll saw, a band saw, hand tools, soldering irons and more. Computers are readily available with design software that includes Corel Draw, the Adobe suite and associated programs that help these machines run. The Makerspace has an open door policy although students need to be familiar with how to use the tools and operate them safely. 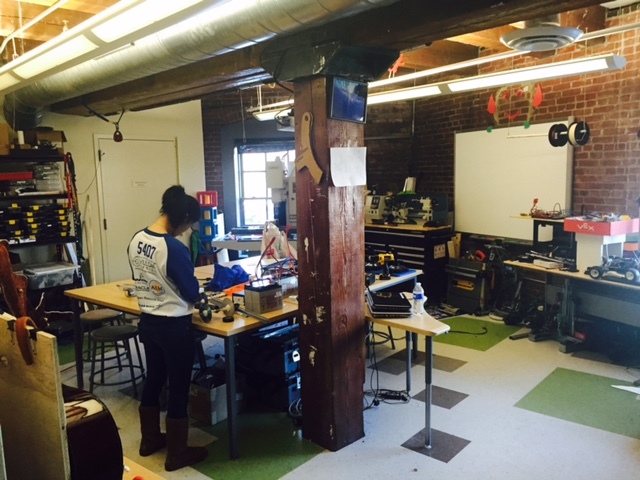 AIM’s makerspace is collaboratively run by the Robotics and Technology Directors although with more sharing of information and training, the space can be run by many others. The Makerspace is both a space and a concept. For the most part, this space and the materials within it operate within a formal learning environment. This means that although the projects are open ended and student driven, the skills taught within the space require a teacher or ‘expert’ to be show them how to use the tool to design or construct a concept. The tools that students have access to are located in the robotics lab or the Makerspace although teachers are encouraged to integrate the use of the space within their curricula and combined them within multidisciplinary projects. Even though it is located in the middle and high school wing, classes from all grades come and use the space during scheduled class time or to complete specific projects. Lower School: Students are becoming familiar with the tools of the Makerspace and the concept that anything they can imagine they can build. This started out with a simple drawing that was then vectorized and etched out onto cardboard using the laser engraver. Their projects have evolved to building out their ideas using Sketchup to create objects on the 3D printer, and using littlebits to make their projects electronic and interactive. Middle School: Students are using their creativity to design everything from trophy’s for our annual 5K race to presents for loved ones. More and more, they are using the tools at their disposal to incorporate different ideas into the projects for their classes such as laser cutting chromosomes and amoebas as well as designing pieces for their rubber band cars. Upper School: Exploration, discovery, and problem solving are huge concepts that our Upper School students are tackling through the use of the Makerspace. They are allowing themselves to run with an initial idea while continually refining it as they move forward, iterating often and failing forward. Examples of this can be seen by their work on musical trees using makey makey boards or building a guitar-playing robot from scratch. Other students created artist representations of images by laser cutting photographic images onto acrylic. Overall, projects are limitless. Training, education and common planning time are three essential areas that need to be expanded as the Makerspace develops. Not only will the space expand into a larger area, teachers within the school will receive more training on how to use machines, software and see examples about what students have been creating. AIM Academy’s Makerspace has successfully developed over a short period of time with the help of an engineering focused mind that had a background for building, constructing and inventing. AIM thrives within a community of fast moving ideas, collaborative learning and believes that in order to learn we must make mistakes and try again. We are lucky that the Makerspace allows us to practice these same principles in cutting edge ways that provide students will real world skills that they may use in future jobs.